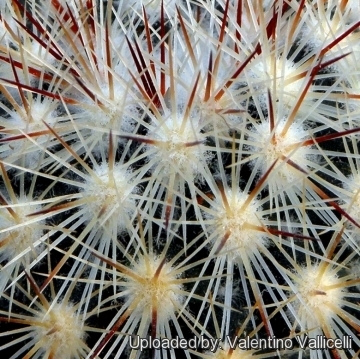 Origin and Habitat: Mammillaria densispina is widespread and relatively common in appropriate habitat on the states of San Luis Potosi, Guanajuato, Jalisco, Aguascalientes, Durango, Queretaro, and Zacatecas, Mexico. Altitude: It grows at elevations of 1750 to 3000 meters above sea level. Habitat and Ecology: This species is found in oak forests on volcanic soils often on large rocks, together with Mammillaria pringlei, Mammillaria gigantea, Mammillaria monancistracantha, Mammillaria uncinata, Mammillaria jaliscana, Mammillaria fuscohamata, Echinocereus polyacanthus, Echinocereus polyacanthus v. densus, Nolina recurvata, Nolina texana, Nolina bigelowii, Senecio praecox, Agave parryi, Agave salmiana, Agave filifera, Arbutus glandulosa, Opuntia robusta, Opuntia streptacantha, Opuntia imbricata, Opuntia tunicata, Opuntia scheeri, Opuntia jaliscana, Ferocactus histrix, Ferocactus latispinus, Coryphantha erecta, Myrtillocactus geometrizans, Dasylirion acrotrichum, Echinofossulocactus dichroacanthus, Neolloydia conoidea, Glandulicactus crassihamatus, Dodonaea viscosa, Arctostaphylos pungens and Acacia farinosa. 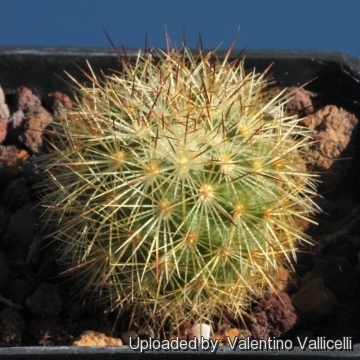 Description: Mammillaria densispina is a tiny solitary cactus particularly priced by Mammillaria enthusiast. Its body is densely covered by translucent pale-yellow or amber-brown spines and produces small yellowish flowers in spring. 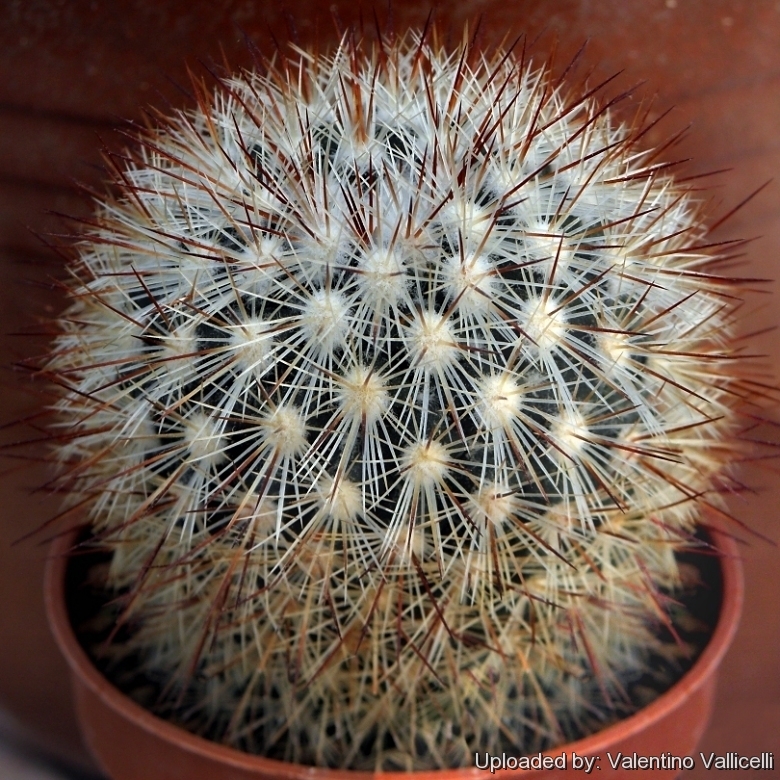 It is vaguely similar in general shape to Mammillaria rhodantha, but does not divide itself dichotomously. The taxonomic relationship between this species and Mammillaria microhelia needs further investigation. Habit: Slow-growing, spherical, perennial succulent, usually solitary. Stem: Globose to short cylindrical, dark green up to 6(-10) cm in diameter and 12 cm tall, entirely hidden by the dense covering of spines. woolly at first, later naked. Radial spines: 20-25 or more, glassy white, pale yellow or pale brownish, unequal, rigid, slender, needle-like, slightly spreading, about 1 cm long. Central spines: 5 or 6, straight, rigid, longer than the radials, bulbous at the base, 10-12(-15) mm long, fuchsine red when new, passing to yellow. Often the upper half or third dark brown. Flowers: Funnelform, yellow, orangish or purplish without, pale-yellow within, 15-20 long. Fruits: Elongated, greenish pink or creamy coloured. Seeds: Obovate, reddish brown, 1 mm in diameter. 11) Sánchez , E., Guadalupe Martínez, J. & Bárcenas Luna, R. 2013. Mammillaria densispina. In: IUCN 2013. "IUCN Red List of Threatened Species." Version 2013.2. <www.iucnredlist.org>. Downloaded on 27 November 2013. Cultivation and Propagation: It is a slow growing species of easy culture, recommended for any collection that needs lots of light with ample airflow. Water regularly in summer, but do not overwater (very wet-sensitively, especially in light of its small root system) Water thoroughly only if soil is dry to the touch, let soil dry in between to prevent root rot, keep dry in winter. Use a very porous mineral-based potting mix, with excellent drainage, as can be achieved by the addition of extra perlite or pumice. Feed with a high potassium fertilizer in summer. Care must be taken with watering as they tends to become swollen and untidy in growth habit if given too much water and shade. Sun Exposure: High levels of light are needed to flower and for good spine development. Can be sunburned if moved from shade/greenhouse into full sun too quickly. During the spring it may be able to take full sun until the heat arrives at the end of spring. In an area that has hot afternoon sun, it may be able to take full morning sun, but requires afternoon shade or afternoon light shade. If grown correctly, it will reward the grower with generous displays of flowers. It is quite frost resistant if kept dry, hardy as low as -5° C (or less) A resting period in winter and strong light are necessary so that it can flower properly.